Plan to attend a special Black History Month celebration on Saturday, February 20 at St. Louis Park High School, 6425 W. 33rd St.
Local talent will be featured at 6:15 p.m. as high school students share performances honoring Black History. 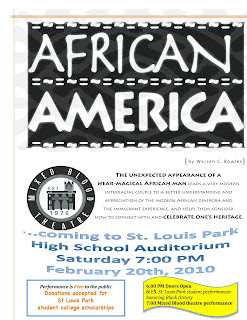 At 7 p.m, Mixed Blood Theater will perform African America. The play features the unexpected appearance of a near-magical African man. He leads a very modern interracial couple to better understand and appreciate the modern African diaspora and the immigrant experience and helps them consider how to connect with and celebrate one’s heritage. The event is free. Donations will be accepted for St. Louis Park student college scholarships. The program is sponsored by Partnership for Academically Successful Students (PASS) and Title One.